Our Christmas Catalogue is packed with a whole host of fabulous One Direction Gifts & Accessories. There's something for every Directioner, so whether you're looking for something for yourself or something to give to a friend you'll be sure to find what you're looking for at 24studio. 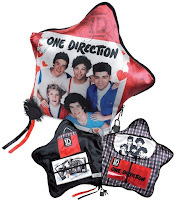 A great gift for any 1D fan! and even better it can be personalised with the name of your choice! 100% cotton personalised towel. Size 150 x 75cm (50 x 29½"). Personalisation: name up to 11 letters. One Direction's fashionable locker. Store all your secrets and accessories in style. Includes stickers. Batteries included. For children 3 years and over. Hear a special Christmas message from the boys of One Direction. Size 22 x 15.5cm (8¾ x 6"). This One Direction 2014 calendar will feature the official new images for 2014, and so the images may differ from those shown. Size 26 x 33cm (10¼ x 13"). 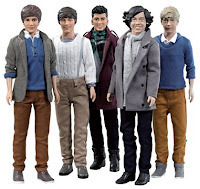 Liam, Louis, Zayn, Harry and Niall, each come with their own personally styled fashion outfits. Collect all 5 members! Colours and style may vary. Height of dolls 29cm (11½"). For children 6 years and over. A fun pillow containing a whole host of possibilities. Write and save your secrets as many times as you like and then just wash to erase them. Comes with a case plus a connector for your MP3 player. For children 3 years and over.